We use your feedback, not only to continuously improve our products but to drive the creation of a wide-range of support materials to ease the facilitation of the observation process. 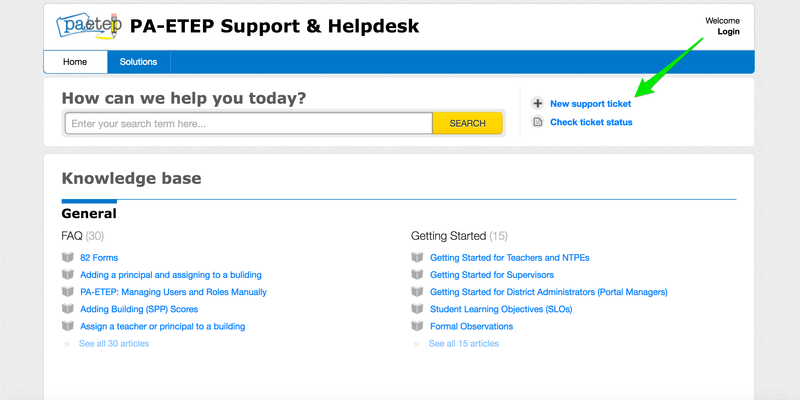 PA-ETEP has a variety of resources integrated into the application for teachers, NTPEs, and supervisors. Help icons can be found throughout PA-ETEP that provide quick guidance within the various observation modules. Additionally, each observation module includes a Getting Started link to introduce users to features of the software and for reference as they become more familiar with the observation processes. Users can find answers to Frequently Asked Questions by browsing FAQ articles that are available in Support materials. PA-ETEP also includes slideshow and video resources that can easily be shared for onboarding new users and refresher training for returning users. Our friendly and experienced staff are standing by to answer your questions and respond to your support tickets eight hours per day Monday through Friday. 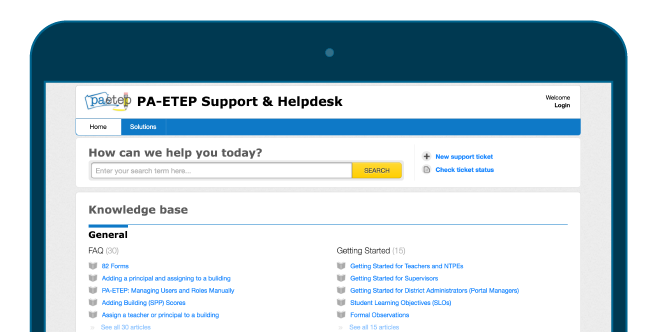 To submit a support ticket to the help desk from your PA-ETEP portal, click Support, then “New Support Ticket.” Or send an email to support@paetep.com. Need to submit a help desk ticket? PA-ETEP identifies individuals who manage their district’s PA-ETEP portal as “School District Admins.” Several resources are available for district admin users including: setting up your portal, understanding and managing user roles, mastering your portal, and staying current with PA-ETEP. View our complete list of resources for portal managers/school district admin users.